Sometimes you just need to get to a file, access a program or just check up on something that you otherwise cannot do from your iPad. For most, remote computing starts out being an occasionally used feature on their iPad that slowly becomes more and more useful. The following guide is intended for individuals that have a single desktop computer sitting at home that they personally use and wish to access from across the internet on their iPad. Both Apple and Microsoft have built-in solutions for allowing remote access to the desktop. Apple uses a technology known as Virtual Network Computing (VNC) and can be configured from within the sharing preferences. Microsoft uses its own Remote Desktop Protocol (RDP) which is configured on the remote tab of the System Properties (just search for “remote” from the control panel). Once configured you can use clients like VNC Viewer (Free, Universal) or Microsoft Remote Desktop (Free,Universal) on your iPad to connect to your desktop provided you are on the same local network. Apple does have a service for iCloud users know as Back to my Mac that will locate and connect to your Mac from across the internet. The trouble is that this is only for Mac to Mac connections and in recent years it has proven to be very slow and less than reliable. Microsoft on the other hand does have a remote discovery service, but it requires you to set up and configure a Remote Desktop Gateway. Google has recently shown off its own solution, which simplifies discovering desktops from across the internet and is known as Chrome Remote Desktop. While Google recently released an Android version of this Chrome app, it has not yet released an iOS version. Perhaps later this year. Being able to quickly and easily locate and connect to your desktop from your iPad over the internet is the goal. Dealing with firewalls, port forwarding, and static ip addresses can be a real hassle for most users to configure manually. All of the apps in the following list have a host application that you need to install on your desktop. This application will automatically take care of making the connection between your iPad and your desktop over the internet. For the most part all you need to do is download, install, and log in to their remote service. PocketCloud – Even though it’s an ad-based app, PocketCloud (Free, Universal) is the best free way to access your desktop computer from across the internet. What I liked most about PocketCloud was how its Touch Pointer made using a mouse on iPad’s touch screen a whole lot easier. It allows you to easily move the mouse around the screen by use of a big virtual mouse transparently displayed on the screen. You can access both the right and left click, as well as easily scroll documents up and down. You will need to download the companion app for either PC or Mac in order to auto discover your desktop computer from across the internet. There is a Pro version of the app for $15 that not only removes the ads, but also allows you to add more than one computer to your remote discovery list. You can upgrade your free auto discovery account to a premium account for $24/yr which will allow you to access files, stream videos, and search your desktop more directly from within the app. TeamViewer – You may be wondering how a remote desktop app designed for larger teams and enterprise customers makes it way to the top of the list for personal use. It is because TeamViewer (Free, Universal) allows individuals to use the app for free, provided you use it for personal, non-commercial purposes. Version 9 of the TeamViewer host is is available on Mac, Windows and Linux. So if you are a closet Linux admin with an iPad, and I do mean that quite literally, then this is a good place to start. You will need register for a TeamViewer account in order to setup and connect your one computer to your free account. Desktop Connect – One of the very first remote desktop apps that I ever used on iOS is still one of the best. If you do find that you are accessing more than one desktop computer, more than occasionally, and speed starts to become more of an issue, then Desktop Connect ($14.99, Universal) is the app to try out first. It is not that either PocketCloud or TeamViewer are necessarily slow, it is just that Desktop Connect is really, really fast. The Easy Connect client software works on PC, Mac and Linux and uses your Google account credentials to connect. If you already have a Google account, then this is definitely the fastest and easiest to get up and running with. Parallels Access for iPad – Another surprise is from Parallels, the makers of the virtual machine software that will run Windows on your Mac. If your first thought was that Parallels Access (Free, iPad) allowed you to remotely access the virtual machines you installed in Parallels you would be wrong to think so. 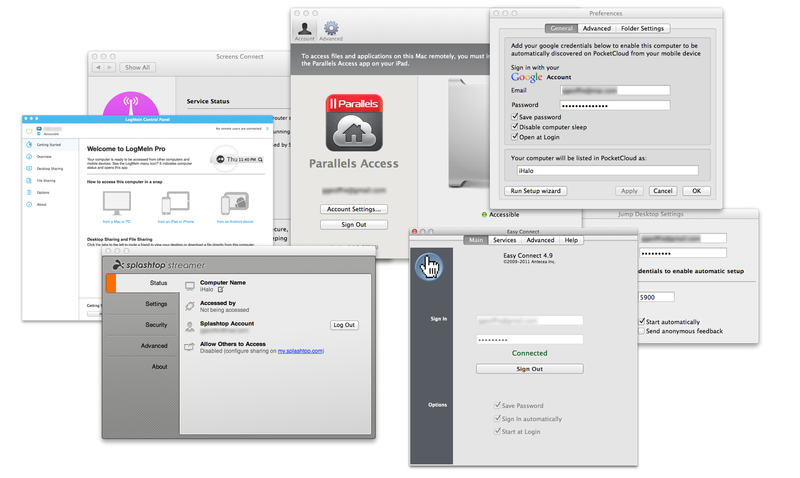 The Parallels Access Agent can be installed on either a Mac or a PC and enables you to access to any desktop from over the internet and does require a $49/yr subscription to use. Their unique implementation of the controls and full use of gestures can isolate each running app on your desktop to make it easier to use on your iPad. If you really need to use your desktop from your iPad on a daily basis, then Parallels Access is worth trying out. Splashtop 2 Remote Desktop – I found the latest update to Splashtop 2 ($19.99, Universal) to be a solid app that was the most intuitive for me personally. I liked the adjustable Trackpad Mode and found the onscreen scrollbars to be really useful as well. If you happen to have multiple screens, Splashtop has an easy access toolbar that features a control that can switch between displays. Their Splashtop Streamer host application works on Mac, PC and Linux. You will need to purchase a $16/yr subscription as an in-app purchase in order to remotely connect to your desktop. These five apps have proven to be simple to set up on your desktop computer, have the quickest discovery and connection times, utilize the easiest to use controls on your iPad, and have the fastest response times when connecting from slower WiFi, LTE or 4G connections. They are also among the most affordable for users that are looking for a remote desktop app on their iPad that works well, even when being used occasionally. Hmm… Good article Geoffrey. However, you forgot to mention one more iOS App: RHUB. It provides web conferencing and remote support all in one box. Its fortknox. How feasible is typing with these apps, when connected over the internet? The scenario I’m imagining is using an iPad with bluetooth keyboard to connect to my home desktop. I don’t already have the iPad, so I can’t test. I’d be on strong wifi at both ends, and actually only a couple miles away. It’s coding, so there’s no app on the iPad I could use; I’d have to get a laptop. But, perhaps not; maybe an iPad and remote desktop would be good enough for the limited sessions I’d need. For long sessions I’d return to the desktop physically. Would the lag be too much to bear? I.e. would I be typing several words ahead of what I see on the iPad before it catches up? Any issues with these apps and using a bluetooth keyboard with the iPad? Thanks a lot for any input. The article itself was just what I needed, as well. I’m surprised you didn’t mention LogMeIn, they’ve been around a good while and have a very mature iPad app. I used them for over a year until they decided to cancel all free accounts and move to a fully paid model. It was too bad but as a casual user it didn’t make sense to purchase a subscription. I switched to TeamViewer which allows free use for non commercial purposes as you mentioned. However, you can have more than one computer attached to your account to access remotely. I have several in my house and a few at relatives’ houses that I can access through this app. Its not quite as slick as LogMeIn but its still a good experience and the price is right. It was on the list, and I do have an account with LogMeIn. I made the same move with LogMeIn as you did, upgraded to a paid account after having a free account for a while. And quite frankly, for the price, the less expensive solutions were easier to setup, quicker to establish a connection when remote, and noticibly faster when connected on slower networks. For someone looking for a low cost way of establishing a single remote connection to their desktop on located on their home network, the other solutions are better options. I really like Remoter Pro. It supports RDP, VNC, SSH, Telnet, RDP over SSH, and VNC over SSH, and does not require that an agent application be installed on the desktop machine (except for an SSH server, if you want to use that protocol). Just to be clear, many of the apps reviewed do not require the use of an agent application on the host computer in order to work. Such is the case with PocketCloud, Desktop Connect, Screens, JumpDesktop and of course VNC Viewer. The whole point of using the agent application on the host computer was to easily enable remote connections through your home network’s router/firewall with little to no hassle. Hence the focus on apps that do provide such an application to make establishing such a connection possible for those who do not want (or have the expertise and knowhow) to bother with manually setting such things up. Additional apps like Remoter Pro may have been considers if such was not the case.